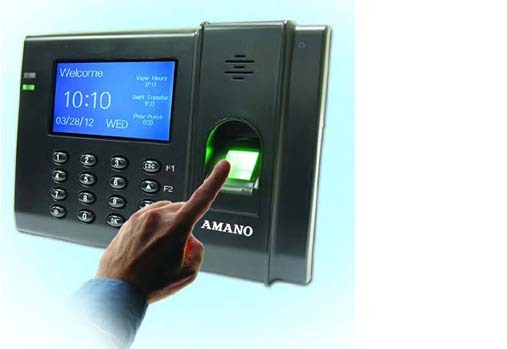 Amano FPT80 biometric time clock system with 3D fingerprint imaging. USB and Network TCP/IP connections. Runs on Windows and Apple. Reduces “Buddy Punching” in office environments. IMPORTS EMPLOYEE LIST from QuickBooks - this is unique! Two stage software included: Easy and Expert. Amano uses the newest technology. 3D digital imaging. It is far more accurate. Developed for over 15 years, digital imaging is much more accurate than standard photographic imaging used by others. There are unresolvable differences between the export formats for Canada ADP, Canada Ceredian, and Canada Quickbooks. Do not order this system if you are exporting to any of the above three Canadian systems unless you can work around it in Excel or some other format. Amano does not provide support on the above three exports. Amano does not support VPN communications.